Located west of oceanside York, Maine, 691 foot Mt. 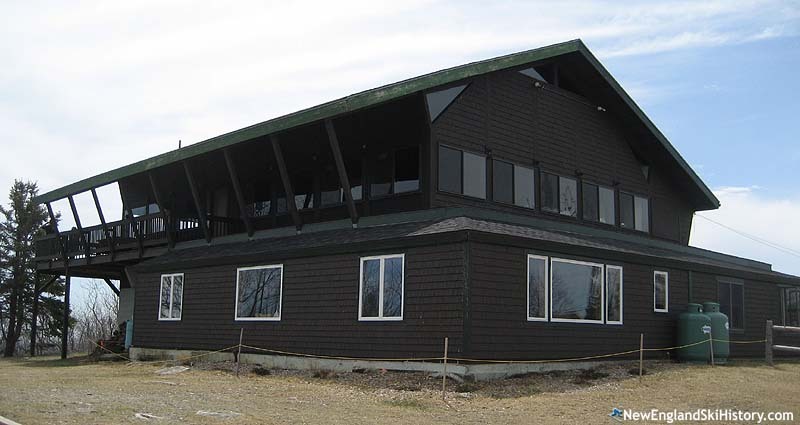 Agamenticus was home to an alpine ski area for about a decade. In recent years, the town has converted the mountain into a four season recreation spot. The early years of development on Mt. Agamenticus centered around detection. The first Mt. Agamenticus fire tower was constructed in 1918, standing for some two decades. Circa 1940, the mountain was scheduled to be turned into a recreational area, however the onset of World War II resulted in the construction of an army radar installation on the summit. In 1948, a $300,000 winter sports development was proposed on Mt. Agamenticus. Fifteen years later, a $250,000 ski area was proposed by Frederick Wakelin and William Pickering. After decades of attempts, "Big A" ski area was finally developed for the 1964-65 season. 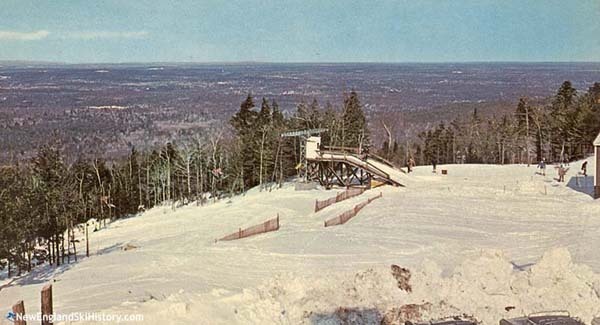 Designed by Sel Hannah of Sno Engineering, Big A was a unique upside down ski area that advertised a 400 car summit parking lot adjacent to its main lodge. Big A was formally dedicated by Governor Reed on Saturday, December 19, 1964 with the surface lifts initially operating. The area was composed of a 2,400 foot double chairlift, a 1,200 foot T-Bar, and a rope tow, supplemented with snowmaking and night skiing. Pats Peak's Ralph Amsden was hired as General Manager. Tom West was named ski school director at Big A in 1968-69. Concerned the nickname Big A wasn't distinctive enough, the ski area was renamed to Mt. Agamenticus for the 1971-72 season. While Big A attempted to capture attention in the early 1970s with special learn to ski programs and a freestyle ski school, it found itself in financial trouble. Following the 1974-75 ski season, owner F. Anthony Zahn, an Oklahoma Democrat politician and financier, proposed a massive real estate development on Mt. Agamenticus. By May of 1975, Zahn owned 500 acres and had 3,500 more under contract with hopes of building up to 3,500 homes. As part of a $5 million project, Zahn planned to add more lifts and expand snowmaking at Big A. After massive local opposition from York and Berwick residents, the development was scrapped, the ski area closed, and the chairlift eventually removed. Following the closure of the ski area, the land was moved into conservation status. Today, the 10,000 acre Mount Agamenticus Conservation Region features multi-use trails that weave through the abandoned ski area. On May 23, 2004, the David N. Hilton Memorial at Mt. Agamenticus was dedicated in honor of the long time firewarden, skier, and historian. "Our family has passed there for many years. What great fun we had! Night skiing, ski school, it was great. We had some great skiers start there . We all had funny stories to share. Our night time trips down to Flos hotdogs, wed order 50 hot dogs...and Flo would throw us out! I was on the chair lift when it came off the rails and two skiers died. We spent 10-12 hours stuck up there until they got to us to lower us down by ropes! Scary! And yet we returned the next day to ski!! We all loved that mountain!" "My family skied there, so convenient,...right at the end of our road. Accessing the summit could be a challenge with ice. Dad decided to try backing up the hill, cause he had a brand new front wheel drive car. It worked. Such a fun place to go as kids. " "I remember scoring my 1,000 point (only my sophomore year) and then trucking up to Big A with John Bridges. The double lift was the best, John and I would close our eyes and pretend we were dragons flying abouve the mountain...Also where I fell and got a compound fracture in my tibia and was never able to play hoops again..pretty much ruined my college career..oh Big A..giveth and taketh away!!! " "Our family enjoyed this ski area so much...as a southern gal, I learned to ski there and loved the hot chocolate and fire in the lodge...."
"I love this big a part out life I’m a yorky and we ski there much we could friend family it good get together cooking bean in fireplace"
"our family had passes 197-75. skied every spare minute there,55 days/year. lots of rain and ice, thus i think the 1st snowmaking system in ME; a giant single cannon attached to snow cat, plus a few ground based nozzles. when it dumped, thousands came from boston. lift lines were over an hour long. would love to see a lift there again someday, but seems impossible." "They had a great toboggan run there in the 60's. My dad would take us skiing there also when we lived in Portsmouth." "Many memories for me. I worked there the 10 years it was open (except 68-69 season I was in Vietnam). Was on the ski patrol, lift operator, snow cat driver,and snow making "
"I skied The Big A several times as a kid. I remember one trip with my Dad necessitated a trip to a garage in nearby York so we could have chains put on our old 1955 Ford station wagon, enabling us to finally climb the steep access road. Wind at the top could be a problem, but I have great memories of my ski trips there." "I skied the Big A when I was a kid. It was fun. We could see it from Annisquam"
"My family, Micum McIntire, held our August family reunions on Mt Agamenticus for several years.. Micum became a land owner in York in 1671. We've been holding our reunions for many,many years. Most recently at the Historial Society in York." "I remember my Dad taking us there on Sunday afternoons and sometimes we went for night skiing. We lived in Portsmouth so it was convenient. They had a toboggan run that was really .We really have a lot of enjoyable memories of The Big A." "There were a number of New England championship enduros for dirt bikes in the 1970s that created numerous trails. Many are used for hiking and biking today. The last race was an all women event called the Powder Puff enduro." "Dad was one of the original investors in the Big A. He owned a local market on Organug Road across from the high school. When my brother Frank and I could get away from school and work obligations we skied there often. The snowfalls at that time and the temperatures were great for skiing. I was an original member of the Juinor Ski Patrol. It was a wonderful part of York." "I ski there when I was kid we love it my mom use bring us meal to top and eat in lodge so we could keep skiing a lot friend we're there"
"I have many pictures of our family traveling there from a Hamilton MA To ski during the late 60s. Loved the novelty of the Inverted hill ." "I have fond memories of the lodge and ski area. I knew one of the caretakers after the ski resort was shut down. Spent many an evening looking down the ski slope to York harbor! It was peaceful and beautiful!!!!" 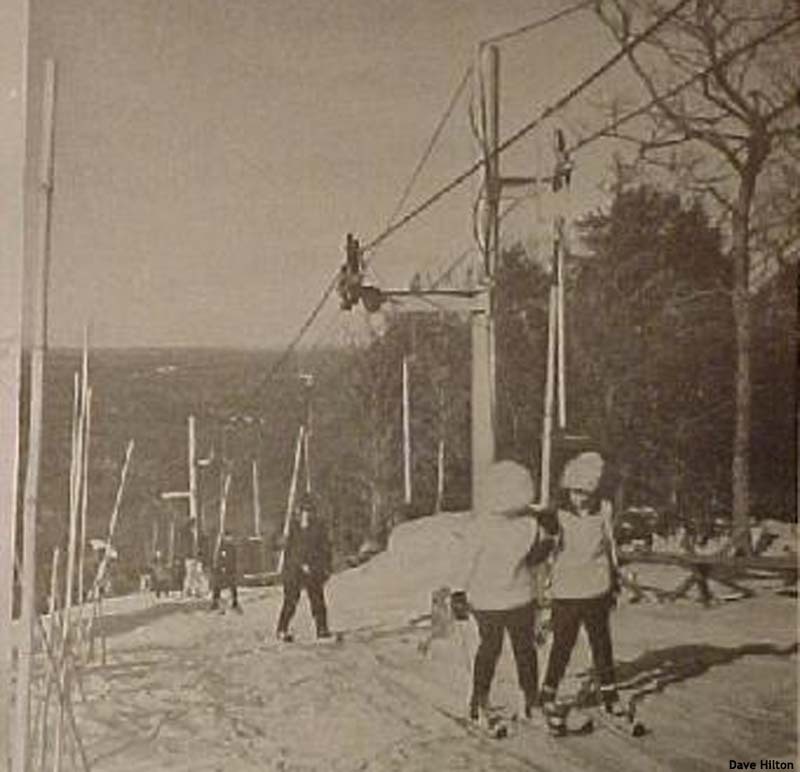 "Skied and had lessons weekly through Portsmouth HS in the mid-60s. Many great times with school friends; I didn't realize it was open for such a short time. I do recall skiing one night when the power went out and stayed off. No problem anywhere else, but the parking lot was atop the mountain by the lodge. Quite a hike up. " "I skied the Big A in the 60's and recall great times with my brother, sister and parents who were regulars up in Maine during the summer season. How fun to be up there with waist high snow drifts alongside the roads into which my father fell once, having a hard time getting out! I loved the Big A and the memories of St. Aspinquid who is buried at the top of Mt. Agamenticus." "I skied the Big A a couple of times with my family in the late 1960s travelling up from Ipswich, MA. Two unique features, as I remember, were that one parked at the top of the mountain where the main lodge and ticket office were located and you could see the ocean from the top. The Big A was a really fun place particularly after a good snowstorm." "My wife and I visited the Big A today, 8/14/13.....what a beautiful place. Sad to see the old signs of a the old ski area. I grew up in NH and we too had a defunct ski area close. Like the Big A the trails are grown in and some equipment is left. Memories of some good times back in the 60s and 70s."